Michael Kropf, center, with the Apple Hill String Quartet last winter. This year—2018—is momentous for Apple Hill. This year marks the tenth year with Lenny Matczynski as director. Ten years for the Apple Hill String Quartet. Ten years of a long and hard-won transformation. At Apple Hill, I feel entirely recognized and nourished as a human being and as a musician and believe in how much this space helps people from all over the world thrive and find their voice. The story of Michael Kropf illustrates the remarkable development of a musician in ten years. Michael attended Apple Hill for the first time a decade ago as a teenage violinist. Over the years, he was coached by our faculty, including Apple Hill String Quartet violist Michael Kelley, and went on to study music, completing his master’s degree in composition at San Francisco Conservatory of Music in 2016. 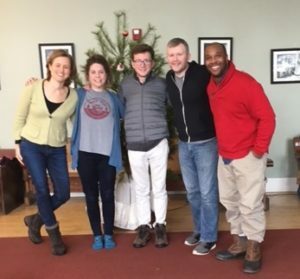 Michael’s aptitude for composing was reinforced at Apple Hill and culminated in a new commission for the Apple Hill String Quartet that premiered last year and will debut in New York this spring. With 45 faculty members coaching over 300 students on our Nelson campus, this gradual transformation is one of hundreds at Apple Hill. The magic of Apple Hill is learning about people and community through the medium of chamber music. It’s also about learning chamber music through the medium of community. Tuition for one student to attend the summer workshop is $1,800 per session. While student tuition covers a large portion of the costs associated with the overall program—housing, faculty, and meals—Apple Hill, with the help of many generous donors, subsidizes $240,000 in scholarships annually. We very much hope you will consider increasing your support this year. Your gift will not only provide the needed support for our programs, but you’ll also strengthen our musical community. Thank you for your consideration.